Refugees in Athens, 2018. Credit: Photograph provided by research participant to author. All rights reserved. The scale of forced displacement to Greece is well-documented, having reached unprecedented levels for any European Union (EU) country in 2015. Three years later, and despite significant spending, many of the global humanitarian agencies such as UNHCR and the European Union continue to show insufficient interest in providing meaningful support. This is evidenced by the horrendous reception conditions for refugees still arriving and residing in Greece. However, alongside this neglect, a network of alternative, grassroots humanitarian initiatives have blossomed, with the aim of providing assistance to displaced persons in more egalitarian ways. The emergence of these ‘solidarity’ initiatives can be linked to larger social mobilisations of the Left since 2011, as well as to growing demands to support the material needs of refugees since 2015. Greek solidarity movements have rightly received much public, political and academic attention over the last five years, most of it positive. During this period, a remarkable amount of material and financial donations have arrived from across the world, as well as many international volunteers. Yet one key humanitarian figure is missing from almost all of these discussions: refugees who themselves are volunteering in response to displacement. In many organisations in Athens, young single refugee men and women are active in the delivery of care services. These include free dental and medical care, social pharmacies, youth centres, language and business training, and community kitchens and clothes shops among other things. Yet despite the visible presence and contribution of refugees in Athens they are rarely represented in official discussions and publications, unlike volunteers from the global North such as myself. This bias triggered my own interest in how, if at all, refugees perceive themselves as ‘humanitarians’ and their participation as volunteers more generally. While it is widely-acknowledged that gender relations undergo processes of change during forced displacement, attention to male-specific forms of social identity in exile remains relatively rare. In general, there has been little engagement with refugee men as subjects who experience and respond positively to the implications of the injustices they face. Most analyses tend to assume that normative power dynamics between men and women are disrupted and renegotiated as a result of either the diminished socio-economic standing of refugee men or the ‘emancipation’ of refugee women in the host countries of the global North. These discourses promote and sustain highly gendered and racialised understandings of who it is that needs to be ‘secured,’ both in terms of those who are perceived as helpless victims in need of ‘saving’ (i.e. women and children), and those who are seen to pose a potential threat (i.e. ‘Other’ men). In Greece, refugee men experience this representational discrimination through their systematic exclusion from the humanitarian care and assistance that is provided by both the state and independent organisations, irrespective of their needs. In spite of such marginalisation, many of these men choose to support other refugees in both less and more fortunate situations than themselves, and often without any immediate benefit to their own precarious lives. In this context, acknowledging the humanitarian action of young refugee men is significant, not only in foregrounding their attempts to redefine the terms of their own inclusion in humanitarian responses to displacement, but also in challenging suspicions in Europe that such men pose an inherent threat. In the summer of 2018, I conducted research with ten male refugee-volunteers, who, being both young and single, are typically the target of anti-immigration policies and sentiment. 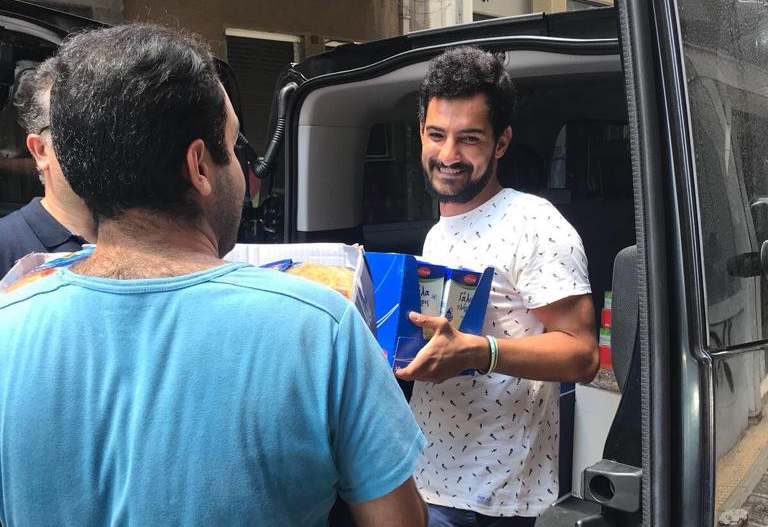 All of these men are currently volunteering in different organisations across Athens, having fled their countries of origin for a variety of different reasons. Nassif and Mohammed’s experiences highlight the ways in which refugees’ collective enactments create a sense of belonging that is rooted in forces beyond traditional paradigms of language, culture and nation. Despite different experiences of displacement, a shared sense of precariousness in exile provides the spur for refugees’ humanitarian action. In this sense, refugee humanitarianism not only responds to immediate needs but is also embedded in reciprocal exchanges beyond material or rights-based assistance. On the other hand, hearing other refugees’ stories of conflict, cruelty and displacement is also seen as the greatest challenge of volunteering as a refugee. In response to such challenges, many men spoke of developing a greater capacity for expressing tenderness, vulnerability and care in order to negotiate the complex and difficult emotions involved in the humanitarian encounter more effectively. One of my other interviewees from Afghanistan, Pezhvak, was homeless for a long time whilst volunteering in a legal support team which, among other things, helps people to find accommodation. He told me that one-to-one legal assessments “[are] really tough, [because] you have to hear some really tough stories...at the end of this I became more strong. I had empathy, I had sensitivity.” Such expressions of care are central to the ways in which young refugee men conceive of and provide effective humanitarian assistance. In this way, the ability to express pain and care more readily with others who have also felt the effects of forced displacement not only shapes the ways in which refugee-volunteers support other people but also fosters more enduring ways to cope with their own grief. The success of mimicking or recreating lost familial bonds is always partial, yet the relationships that volunteering creates are significant for single refugee men and their need to care and be cared for. Yet attention to the multiple ways in which caregiving is provided by refugee men - and its value for those who give and receive it - is important in helping to disrupt the growing assumption in the West that male refugees, especially those from Muslim backgrounds, are by ‘nature’ non-egalitarian, brutish, and violent. If we are to challenge the image of refugee men as incapable of responding positively to extreme social injustice, this process begins by acknowledging their own positive responses to the forced displacement of others and themselves.